A hands-on, practical survival guide from retired Navy SEAL Clint Emerson - adapted for civilians from actual special forces operations - to eluding pursuers, evading capture, and surviving any dangerous situation. In today's increasingly dangerous world, threats to your personal safety are everywhere. From acts of terror to mass shootings, and from the unseen (and sometimes virtual) matrix of everyday crime, danger is no longer confined to dark alleys or unstable regions. Potentially life-threatening circumstances can arise anywhere, anytime, and Clint Emerson - former Navy SEAL - wants you to be prepared. This complete course in survival teaches you how to prevent tracking, evade a kidnapping, elude an active shooter, rappel down the side of a building, immobilize a bad guy, protect yourself against cybercriminals, and much more - all using low-tech to no-tech methods. 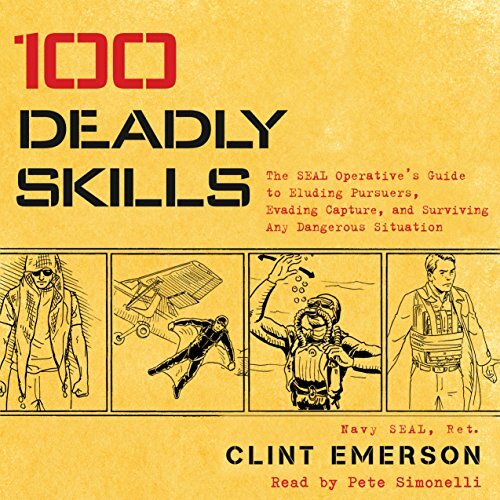 Clear, detailed, and presented in an easy-to-understand and execute format, 100 Deadly Skills is an invaluable resource. Because let's face it, when danger is imminent, you don't have time for complicated instructions.